Steps to save the windows background color with the theme? How to change the theme and background of windows 8 release preview? How the background theme set by default on Windows 7 screen can be altered on Acer laptop? Is there anyway to stop the Windows Problem reporting task which runs in the background? Re: Steps to save the windows background color with the theme? 1.Make any changes you want to your current theme .Right-click on your desktop and press "Personalize". 2.Click "Theme," the second-to-last setting from the bottom. In Windows XP, open the "Themes" tab. 3. *Press "Save As" and save your new theme with whatever name you want in the directory that opens up. Press "OK." Your Windows theme is now saved and you may access, change or delete it at any time. Its very easy to set the theme or change the windows background color in windows 8. Switch to the category view & select "Appearance & Personalize" option. A new window will appear & you'll see all the themes present in your computer under My Themes dialog box. Click on the theme which you want to set. You can change the theme appearance settings, the time interval & the screen appearance from the Desktop Background option. Click on the windows color option & set the color as your wish. You may set the primary colors-also you can select different kind of mixed colors from the color setting option. Click on Save changes option. Now quit from all of the window and you can see the theme & the window color that you've been saved. 1. Make a Right click on your desktop and select 'Personalize'. 2. At the bottom of the window, you will see an icon that says: Window Color. click on it. 3. 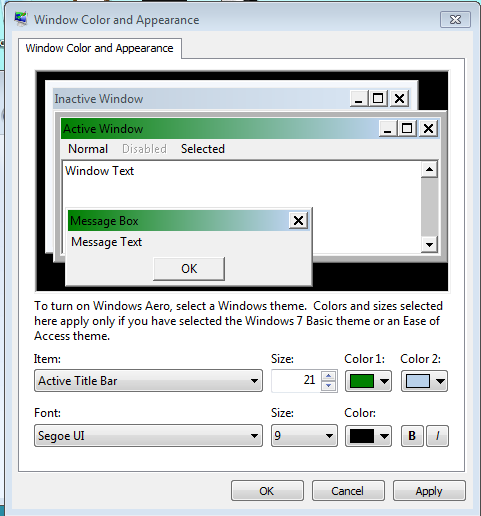 The windows color and apeperance window will appear,, now you can customize, modify or change the colors you want. Themes to design the setting to options to avoid them to conviant process..
- set back ground process..
- Red,Green,Yellow page to convert all types of colors. - Color to set them.. These are to follows the steps to convert goes.. This is very simple procedure to change the your background as color and save it as a theme. 1. Right Click on the Desktop open area and Lunch to personalizer . Open the control panel and Lunch the personalizer. 2. In the Personalizer go to Backgrounds. 3. Go to Solid background. 4. select a solid color for background. 6. have you interested to change the color schema , sounds and mouse pointer. 7. Click on save theme. 8. enter require name for theme, and Save it. 9. You can change these themes simultaneously. Now you can create and change themes dynamically. This is very simple procedure to change the color of the background and Save as a theme. 1. Right click on Open area of the desktop personalizer. Open the control panel and Open the personalizer. 2. Go to Desktop backgrounds . 3. Click on Backgrounds category . 4. Chose the Solid color. 5. Click on The Save changes. Customize the all settings . 7. After a button is appear on themes panel . 8. Enter the require name for theme. Now haply customize your theme. This is very simple procedure that change the color schema of the windows 7 operating system. 1. Open the personalizer by right click on the open area of the desktop. 2. Go to color schema settings. 3. change the color schema. ( if aero is enabled the color will be effected other wize not effected ). 4. Clikc on save changes . Automatically your color schema will be changed successfully. If you want to change the color in various effects. then follow these steps carefully. 4. go to Advance appearance settings. 5. Click and edit the color of various windows borders and areas. haply change the color of your windows. you need to following some simple steps. ->right click on the screen. ->here there will be windows color option. If you want to save the windows background color theme ..So i will help you to do this problem that ow can save the windows background color theme..
First of all just go and right click on your windows desktop .then select the personalize option. A new personalize window will be open ..